Protein tunnels connecting the functional buried cavities with bulk solvent and protein channels, enabling the transport through biological membranes, represent the structural features that govern the exchange rates of ligands, ions, and water solvent. Tunnels and channels are present in a vast number of known proteins and provide control over their function. Modification of these structural features by protein engineering frequently provides proteins with improved properties. 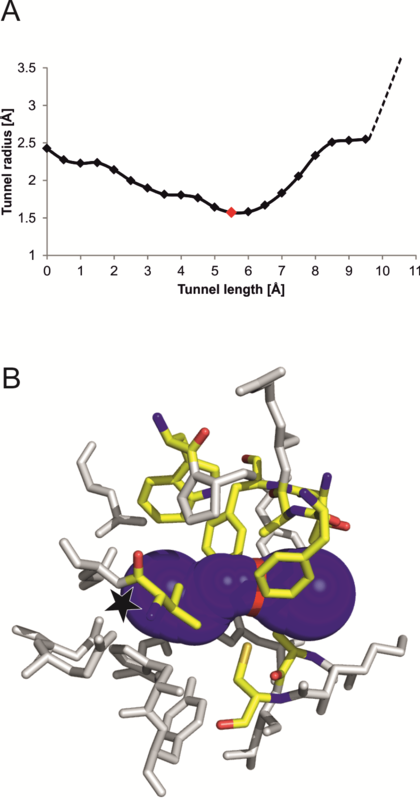 Here we present a detailed computational protocol employing the CAVER software that is applicable for: (1) the analysis of tunnels and channels in protein structures, and (2) the selection of hot-spot residues in tunnels or channels that can be mutagenized for improved activity, specificity, enantioselectivity, or stability. The anthropogenic toxic compound 1,2,3-trichloropropane is poorly degradable by natural enzymes. We have previously constructed the haloalkane dehalogenase DhaA31 by focused directed evolution (Pavlova, M. et al. Nat. Chem. Biol. 2009, 5, 727−733), which is 32 times more active than the wild-type enzyme and is currently the most active variant known against that substrate. Recent evidence has shown that the structural basis responsible for the higher activity of DhaA31 was poorly understood. Here we have undertaken a comprehensive computational study of the main steps involved in the biocatalytic hydrolysis of 1,2,3-trichloropropane to decipher the structural basis for such enhancements. Using molecular dynamics and quantum mechanics approaches we have surveyed (i) the substrate binding, (ii) the formation of the reactive complex, (iii) the chemical step, and (iv) the release of the products. We showed that the binding of the substrate and its transport through the molecular tunnel to the active site is a relatively fast process. The cleavage of the carbon–halogen bond was previously identified as the rate-limiting step in the wild-type. Here we demonstrate that this step was enhanced in DhaA31 due to a significantly higher number of reactive configurations of the substrate and a decrease of the energy barrier to the SN2 reaction. C176Y and V245F were identified as the key mutations responsible for most of those improvements. The release of the alcohol product was found to be the rate-limiting step in DhaA31 primarily due to the C176Y mutation. Mutational dissection of DhaA31 and kinetic analysis of the intermediate mutants confirmed the theoretical observations. Overall, our comprehensive computational approach has unveiled mechanistic details of the catalytic cycle which will enable a balanced design of more efficient enzymes. This approach is applicable to deepen the biochemical knowledge of a large number of other systems and may contribute to robust strategies in the development of new biocatalysts. There is a continuous interest in increasing proteins stability to enhance their usability in numerous biomedical and biotechnological applications. A number of in silico tools for the prediction of the effect of mutations on protein stability have been developed recently. However, only single-point mutations with a small effect on protein stability are typically predicted with the existing tools and have to be followed by laborious protein expression, purification, and characterization. Here, we present FireProt, a web server for the automated design of multiple-point thermostable mutant proteins that combines structural and evolutionary information in its calculation core. FireProt utilizes sixteen tools and three protein engineering strategies for making reliable protein designs. The server is complemented with interactive, easy-to-use interface that allows users to directly analyze and optionally modify designed thermostable mutants. FireProt is freely available at http://loschmidt.chemi.muni.cz/fireprot. Babkova P, Sebestova E, Brezovsky J, Chaloupkova R, Damborsky J, 2017: Ancestral Haloalkane Dehalogenases Show Robustness and Unique Substrate Specificity. ChemBioChem (in press, doi:10.1002/cbic.201700197). full text. Ancestral sequence reconstruction (ASR) represents a powerful approach for empirical testing structure-function relationships of diverse proteins. We employed ASR to predict sequences of five ancestral haloalkane dehalogenases (HLDs) from the HLD-II subfamily. Genes encoding the inferred ancestral sequences were synthesized and expressed in Escherichia coli and the resurrected ancestral enzymes AncHLD1-5 were experimentally characterized. Strikingly, the ancestral HLDs exhibited significantly enhanced thermodynamic stability compared to extant enzymes (ΔTm up to 24 °C). Compared to extant HLDs, the ancestors displayed higher specific activities with preference for short multi-substituted halogenated substrates. Moreover, multivariate statistical analysis revealed a shift in the substrate specificity profiles of AncHLD1 and AncHLD2, which would be extremely difficult to achieve by rational protein engineering. The study highlights that ASR is an efficient approach for development of novel biocatalysts and robust templates for directed evolution.